We are all equipped with the ability to connect to our spirit guides and Angels, although everyone has different ways of going about doing so. We are communicated with daily and ongoing, but most of the time it seems we are not, simply because we have not exercised our sixth sense as much as we have our other senses. Once you become aware of how you transmit and receive information to and from spirit, it starts to be much easier to know when it’s happening. 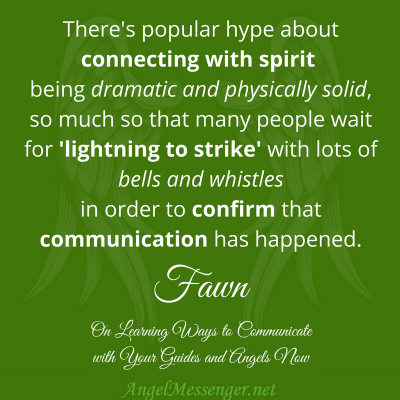 There’s popular hype about connecting with spirit being dramatic and physically solid, so much so that many people wait for ‘lightning to strike’ with lots of bells and whistles in order to confirm that communication has happened. But in reality, most spirit contact is subtle and sensed in the body while “seen” in the mind/spirit awareness. It’s a certain ‘knowing” and trusting in our sixth sense of connection with spiritual energy which allows us to receive and send messages to our guides and Angels. A doubtful and skeptical attitude often blocks the path, so this is why its very difficult to “prove” the existence of spirit and ‘power of prayer’ to a person who has a disbelieving mental attitude. The lower energy can dampen a most profound spiritual experience, and unless you are strong in your faith, create energy blocks to being able to communicate. One reason to pay very close attention to the ‘feeling’ of all energy you are connected with and that which is connected to you, is because feeling/sensing is one of your safeguards as you navigate within the veil between worlds. A valuable thing to know when learning to connect with and communicate with your guides is to learn about the seven primary chakra centers of your body, and how to sense them. Each chakra correlates with a meaning and life lesson, a body section and a spiritual focus in your physical life that you are working with. Often as you communicate with spiritual energy, you will feel sensations in these chakras of your body which will show you what you need to know, and how to go about receiving a message. Empaths will often ‘feel’ the pain and distress of others through chakra energy centers, via a sensation that presents itself in a certain portion of the body For example, a stranger can walk into a room and if my throat begins to feel sore I have learned that this means the person recently had an encounter of arguing or feelings have been hurt. The throat chakra is a communication area and also represented by the color blue which can be visualized to ‘cleanse’ the person’s throat chakra, including your own, to bring light and healing energy to a situation. A second example is ‘feeling’ the pain of someone who has gone through gastrointestinal surgery, an empath may be near a person who has gone through such an experience and has some blocked and slightly painful energy in her/his own abdominal area. This is energy perception through chakra awareness and once you begin to interpret the broader meaning of subtle sensations in your body coming from a source not your own, you begin to translate these experiences into spiritual communications, Chakra energy awareness works with Spirit Guides and Angels the same way. A wonderful book to read more about this is Anatomy of Spirit, by Carolyn Myss. agreed to learn in your physical existence. Sometimes the dream will be concerning and sad, requiring you to face a choice or an experience that brings deep and intense emotions. Sometimes the dream will announce a birth or a death, and most always these dreams will represent a sign post, and/or turning point in your life to pay attention to. If you write these down and watch your life unfold from that point onward, you may begin to realize that a dream is a message from your Guide. Sometimes you may spontaneously ‘see’ an image in your head that tells a story or conveys a feeling or familiarity. Your spirit guide will often share an image or a thought form that you may brush aside as your imagination or a random piece of information your brain created, when in fact, it is a message. For example, you encounter a woman in a supermarket who is quietly standing in line behind you at the cashier counter. For some reason, you think of making a cherry pie tonight for dessert and decide to let the person go ahead of you so you can go get some more ingredients to buy. As you explain you are running off to get cherries for a pie, the woman in line tells you that there is a pie contest event happening down the block this evening and gives you a flyer. You decide to check out the pie event and run into a friend you haven’t seen since sixth grade. Someone you have been longing to see how she has been doing and could not find any contact information for. As you backtrack your day, you realize how thinking of cherry pie prompted you to take action and speak up to the lady in line, who gave you information which brought you to the pie event where you ran into your long lost dear friend. Following your impulse to speak up and to check out the pie event was saying “yes” to your Spirit Guide, who gave you that image of cherries just as the woman who acted as a messenger got in line. These sorts of simple yet powerful events are often not confidences and synchronicity, they are spiritual guidance. 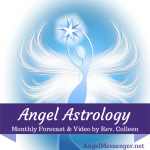 Likewise, Angels are available as helpers and facilitators when you pray and visualize. If you find yourself in a traffic jam due to an accident, praying for Angels to facilitate support and healing for those who were involved in the traumatic event is effective and helpful. Visualizing Angels coming to help is a form of prayer that is powerful. You do not need to see evidence of this right away, but the practice of prayer and connection with Angels during times when you are able will show you over time that your prayer energy is important and needed. For example, you will find yourself guided to scenes of seeming tragedy or need, just so that your prayer energy can be brought to light. Recently I drove four hours to the southern coast of Oregon in order to hike on the beach that afternoon, I arrived less than an hour after a father and his toddler child were swept away to sea by a wave that they didn’t see and expect as they walked along a dip in the sandy beach. Rescue workers, Coast Guard boats, helicopter, rescue divers, EMTs and volunteers on four wheelers were out scouring the shores for any sign of the father and son’s bodies. My friend and I were the only two out there who were not part of the first responders. I recognized the meaning of being guided to that beach at that time and instead of hiking the trails I sat on the beach where the bodies were hidden beneath the waves and prayed to my Angels and theirs – requesting safe and peaceful passage to spirit. I sensed that their souls were crossed and all was good. I saw images of Angels. I knew that it was important for someone to be on that beach praying to Angels during this transition. I recognized the honor of being there at that exact time. 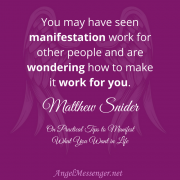 Faith that it’s important, that prayers matter, that asking Angels for divine intervention is real, effective and significant, this is vital to working with Angel energy. Vision boards allow you to focus on prayerful thoughts and to connect with Spirit Guides and Angels. 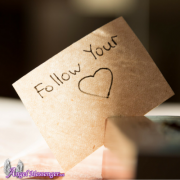 To cut out images of desired physical outcomes, including words and phrases that empower, and then paste them onto a piece of cardboard or paper so you can hang it where you can see it often, this is a way to bring to you guidance from spirit that will lead you to what your heart desires. When you request something clearly as in a vision board, putting the desire “out there” and then focus on this with a belief that you are not alone and the universe, God, your Spirit Guides, and Angels are listening, you create a higher vibration which is like a pathway that now exists between yourself and your desired outcome. Moments and messages will offer themselves which you may listen to along the way, bringing you what your energy is focused on. 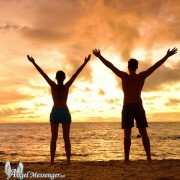 When you clearly create a desire as in a vision board, you are manifesting a focused desire through spiritual help. As you receive images or impulses, feelings and a sense of ‘knowing’ in your daily life, become aware of these energies and determine and discern if the sensation is from an outside source or from an inner one. Discern if healthy or not. Learn to take a risk with impulsive prompting and take action or speak up even if it doesn’t make sense, as in the example of suddenly wanting to make cherry pie. As you practice this new form of faith in making sense out of seeming nonsense, you begin to learn a new language. It’s fun and it’s part of your spiritual birthright, to communicate with your Guides and Angels. Prayer with a focused intent is powerful, and when you visualize a bright Light above your head (crown chakra) and project your prayer with the feelings that accompany your thoughts, to the Light, you are creating a direct connection to Spirit. As you go to this place and dwell in your prayerful communication, you are also able to pause the thoughts and mental actions long enough to receive messages. These often come in the form of feelings, such as inspiration, impulse to take action, a ‘knowing’ about something, and even new information you were not even praying about. If it feels healthy, non-harmful, helpful and free, the information source is from a Spirit Guide, Angel, and God Source. “all that is” element to the character, and a playful outlook. This attitude in pure form is a state of Being that allows connection to Spirit. When you travel to a new place and have no preconceived expectation of what you are going to experience or see, you are opening up a doorway of possibilities which allow Spirit Guides to connect with you. This is why travel is so much fun for many people because it feels at times like magical things happen. In fact, they do. But you don’t need to take a trip to have “magic” in everyday life, to speed up the coincidences and synchronicity. When you release expectations and along with these, your anxiety and fear of the unknown which you cannot control anyway, you are speeding up your ability to communicate with your Spirit Guides and Angels. Expectations are blocks to gifts from Spirit, so rather than expecting a certain timing or specific answer to the desired request, it is best to let go along your way with trust that your communications have been acknowledged and answers will present themselves in their own timing. The flow is faster, the moments are more joyful and the communication is more clear when you release all attachment to outcome and trust that the ‘highest good for all concerned’ will occur, and this highest good is good for you, too. When you speak with a Psychic Adviser, you are hoping for a sign from your Spirit Guide and/or Angels that the reading is authentic, waiting for certain clues in words from the reader. Often you will receive exactly what you need to know and the message you hear is exactly the message meant for you at the moment, but the expectation is so strong about certain outcomes and details that the Spirit guidance goes unnoticed. By realizing that all interactions are important, that people can be messengers from Spirit, and so can animals, events, turns of events that don’t make sense, and nearly all things that occur in your day to day life, you will begin communicate better with your Spirit Guide and Angels. Simply reading this is part of the “plan”, as it either plants a seed for future learning, confirms what you already know, or reminds you that it’s time to connect deeper today. As you are able to release anxiety and trust timing and outcome, with the detachment of a child, you are going to get what you need, including your answers. Remember that you connect with Angels and Guides, with your intention to connect, and you receive through your feelings, impulses and your dreams/awareness. Trusting that you are not just “making it up” is a good start, and writing down your impressions in a journal can be helpful, too. As you practice this more, your coincidences and synchronicities will begin to speed up! Fawn is an amazingly accurate Psychic and Shamanic Practitioner. She was one of our original Tested and Trusted Angel Messenger Practitioners and is currently a contributing author here at Angel Messenger. Shamanic readings are unique in that they focus on spiritual healing and resolution. Often physical symptoms accompany a need for spiritual healing, because everything is connected. Fawn will journey by drum prior to your connection by Skype, phone and/or email and ask a question you send to her in advance. She will usually connect up with your power animal right away, and then bring back for you any message that spirit gives her for you to hear. Often she will receive a time frame but sometimes not. The information comes in on a 'need to know" basis. "I can't say enough about Fawn. After over a year of speaking with her, she is truly gifted. I admire the way she guides me; telling me about my path and the road "blocks", always keeping the conversation positive. I don't feel alarmed or worried after our time together. I'm eager for what's to come and aware of what is surrounding me. Thank you!"